Rockwell has built a stack that is their IIOT integrated solution–typical to their business model, rather than build on solutions in the IOT space, RA has developed their IIOT stack as an extension of their existing architecture. FactoryTALK Cloud is RA’s cloud solution–running on Azure? Why make analytics data a separate stream of data when protocols exist where edge values and cloud values can be published together? Is the gateway report by exception or is it polled from the cloud? Dashboards are static… any custom development possible? RA has a cool offering here for OEMs… there are some issues that I expect them to work out in the next 12 months related to data access, dashboard customization and on Premises cloud servers. As a whole, this is very similar to PTC Thingworx but without the customization available from PTC. I’d like to see RA adopt a single stream architecture using hub and spoke to an on Prem broker but we will have to wait and see if this develops. Intellic is attending Rockwell’s Automation Fair in Houston, TX. I arrived on Monday and the team joined me yesterday at the Le Meridien hotel in downtown. Over the next two days, we will attend sessions and labs, meet with product managers and enjoy fellowship with the Rockwell Automation community. My specific plan is to get an update from the product managers on RA’s plan for Industry 4.0 and IIOT. After perusing the literature, I have read no references to MQTT or the Sparkplug B specification. IIOT is one core focus of our business and we find there is a huge interest across our client base to natively integrate from the plant floor up to the enterprise and onto the cloud seamlessly and out of the box. The goal this week is to learn what Rockwell has planned to help Intellic serve its clients. If you see us wandering around… please offer a tip of the hat and a hello. Well… ICC 2017, Transform, is in the books. After 3 days of sessions, networking, fellowship, food and libation–yours truly and the rest of Team Intellic is pooped. We had an amazing time with the community and thank Steve Hechtman and the rest of the Inductive Automation team for putting together an awesome conference. A special shout out goes to our Sales Rep, Vannessa Garcia, for all of her hard work coordinating the various meetings we scheduled with clients, IA staff and other members of the community–thank you!! This was also the first show, since 2013, where so many of the attendees were first-timers. There are several new Integrators–created in the past few months, from Europe–who made the trek to ICC in hopes of getting guidance building their business models. I spoke personally with more than 300 of the attendees and was struck by how many were attending for the first time. This is awesome! Colby and Carl with the future of the platform. Lively question and answer… watch the video! Day 2 of the Ignition Community Conference was typically long and filled with a lot of amazing presentations. We capped the evening off with the reception and dinner at the Palladio and then headed off to the Fat Rabbit for libations and fellowship. Yours truly stole away some time to celebrate my wife’s birthday (she is a real trooper with all my travel) and then reviewed all my notes from the presentations and one-on-one discussions I attended. 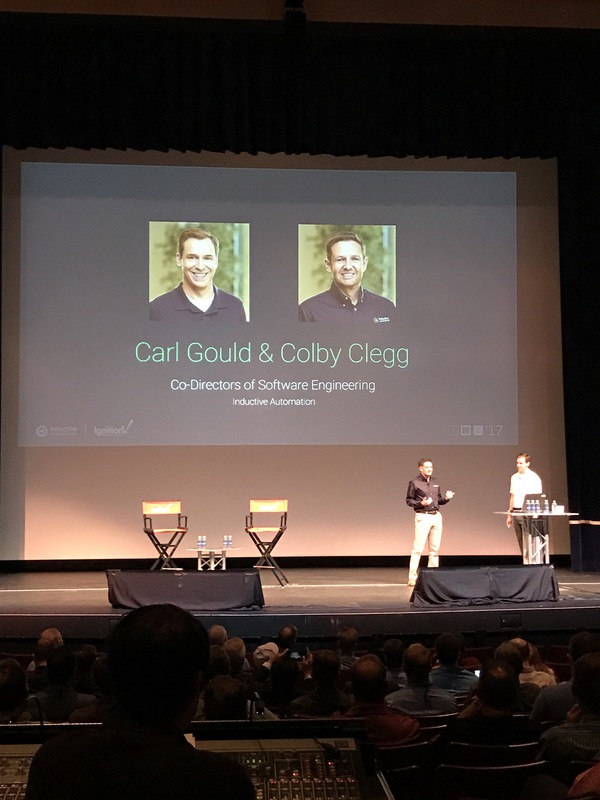 There were no major announcements during the keynote–on the development side, Colby and Carl punted the roadmap discussion to Day 3 and the developer’s panel session. I’m hoping to hear more details about 8.0 (Blaze?) — Ignition’s HTML5 efforts. Travis Cox did announce a new program called Ignition Onboard. Ignition Onboard is a program where hardware companies will be packaging Ignition (likely Edge) on their hardware solution. Opto22 and Hilscher are the first two members. You will know by the Ignition Onboard sticker on the box. Carl Gould announced the future security developments coming down the road during the Security session. 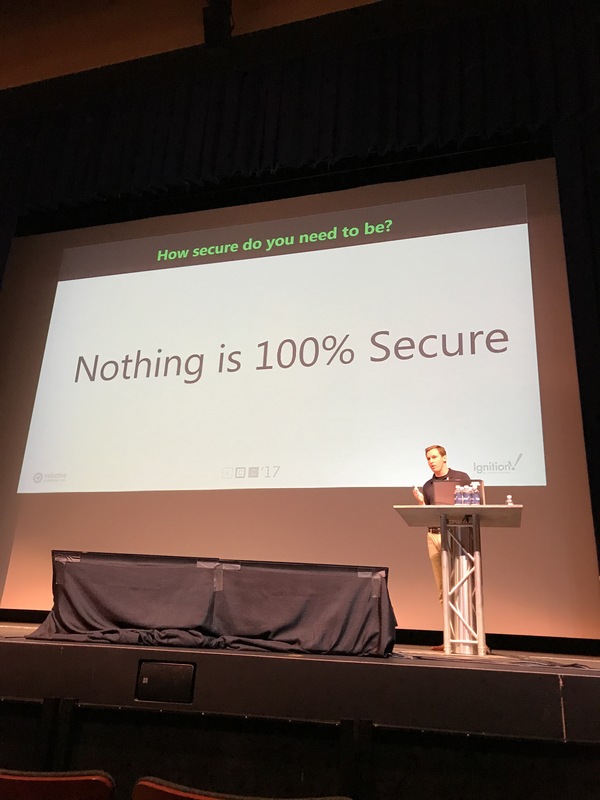 For security… this really was a great session and I highly recommend anyone who missed it to watch the video once it is posted by IA. The highlights are below and should be taken into account for all future development in Ignition. I did ask Carl what effect the pen-testing would have on the release of both the Ignition builds and the module builds… and he said that is still to be determined. For those that aren’t familiar with 3rd party pen-testing… it is when software developers pay a 3rd party to try to hack their software and then report on vulnerabilities. This will be an added step in the development process and will likely slow down the release schedule a bit. I had an opportunity to set up a Skype Session with Perfect Abstractions and one of our clients to demo the 3-D Charts module. Nick has done a great job with the development and our client is excited to get the module installed for some 3D representations of O.D. measurements and time series representations of AQP and OEE. Brown Engineering has a really slick solution on display. Using Ignition and an external sensor–over serial–they have developed an application that builds sequential pick lists and then tracks the operators selections. It is a very cool implementation and has many applications in manual assembly, QC and inventory management. Day 2 was an impressive showing all around. From Sepasoft’s presentation of OEE 2.0 (phenomenal improvements) to the IIOT discussions to Security Improvements… and capping the day off at the Palladio with a spectacular farm to fork dinner. Inductive Automation has not disappointed. Intellic comes to the show every year… I am, personally, here every year… and ICC 2017 is shaping up to be the best yet. Carl Gould presents about SCADA security, Java security and the Ignition road map for version 8.